HAPPY 2 YEAR ANNIVERSARY TO US!! Today marks 2 years of me building and branding Stilettos N’ Hiphop. I have came such a long way I’ve allowed some personal things to distract me from my work but I can honestly say I am blessed and I look forward to this new chapter in my life. I would like to thank all of my readers in the United States to France and the UK you guys warm my heart. I know I haven’t been very consistent but I do read your emails and comments and I will be much more consistent with you guys. THANK YOU THANK YOU THANK YOU! 20K readers I wouldn’t be here without you guys! In celebration of my two year anniversary I will share my latest shoe love. My bigs lol came into town if you know him you know his favorite thing is to shop so we headed over with my best friends to Lenox Square Mall. Our first stop was Macy’s to buy him a belt because he rushed packing his luggage for this trip and forgot his belt (even his underwear that I was sent to go buy like i was his assistant dede lol). As we leave we head over to Neiman Marcus the first place he stops is the Men’s Shoe Department (His love for fine luxury shoes is probably more addicting than mine lol). I sat down as i watched him intriguingly browse and observe different Balenciaga’s (one of his favorite shoe designers) some of what he already has being that he’s on Balenciaga’s preferred list. We leave and go to the Women’s shoe department I browse threw shoes and as I browse my best friend calls me over and say are these the… my mouth instantly drops and I say OMGOSH YES! YES! 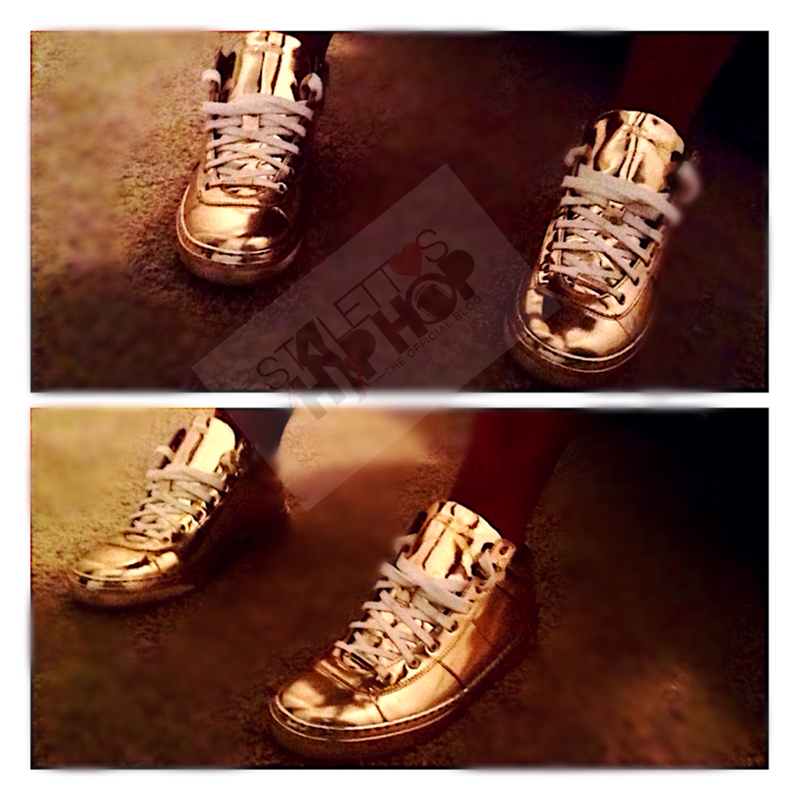 they were the Jimmy Choo golden sneakers that i had been eyeing for MONTHS. I’m thinking to myself like omgosh why did I have to come in here $725 isn’t in my budget shoe Gods NOT TODAY. So as we are leaving Bigs sit downs on the couch my best friend says we’re ready when you are he says “give me a second” so we sit down as well. The shoe salesman walk over to me with the shoe and asks me “What size? “. I immediately turn and look at him and almost cry but I’m kind of mad at the same time because he knows I hate accepting gifts from him and don’t like when he spends a lot of money on me lol…Im weird I know. So I give the guy my size he quickly returns with the shoes and as soon as I put them on they felt like pillows on my feet I walked over to the mirror and fell in love Im like can I have them… like now lol. He gives the salesman his card and they walk over to check out. I don’t really wear sneakers I’m more of a stiletto girl but when they create exclusive different shoes something makes me crave them lol. If this is your type of style shoe you can purchase them at Neiman Marcus or Saks 5th Avenue. They retail at $725 I recommend this shoe its very comfortable and very different.